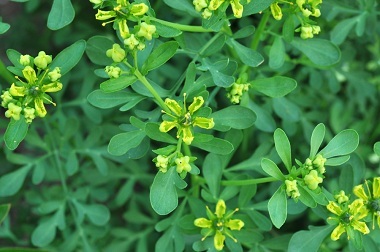 Rue is a hardy herb that is drought tolerant. It not only is a great herb to add to meals (in small doses), but it has medicinal values and essential oils that are highly beneficial. The leaves emit a powerful odour, and although safe to consume in small amounts, it tastes very bitter. Chewing on a leaf or two is said to relieve a headache. In large quantities all parts of this plant are not safe to take. Rue should not be used at all by pregnant women as it can induce abortions. The sap contains furanocoumarins which sensitizes the skin to light and can cause blisters or dermatitis in sensitive people. 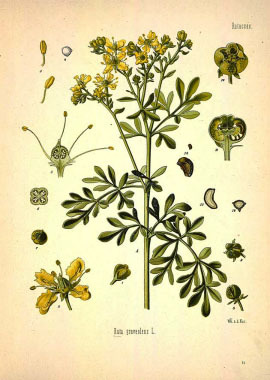 Distinguishing Features: Rue is an erect plant that has bushy branches and can appear to be as wide as it is tall. The flowers are very distinct as they can be almost green in colour in addition to yellow. Flowers: When the flowers on the rue bloom they are generally yellow or a greenish/yellow. They bloom from June to September and are in terminal panicles. 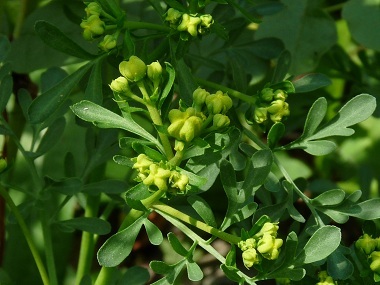 Fields of Nutrition has medicinal benefits and vitamin/mineral content of Rue. 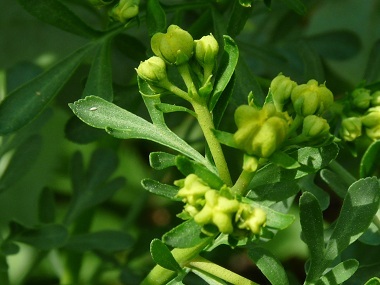 Leaves: Rue leaves are alternate, bluish- green, and they are slightly silvered. Height: Rue can grow up to 60 centimetres and can be almost just as wide. Habitat: Rue likes to grow near rocks, old walls and dry hills, and especially near limestone. Edible parts: In small doses, all aerial parts can be used in soups, sauces, salads, teas and other dishes. It can also be dried and stored for medicinal purposes.